Getting started is sometimes the most difficult part of becoming healthy and “in shape”. The fitness and lifestyle world can be confusing and overwhelming, and getting “in-shape” seems like an elusive goal. How do you know when you are there, and more importantly, am I even progressing to get “there”? Do I need to throw away everything in my kitchen? If you haven’t exercised in years, you may not even know where to start. That’s why it is important to have an outlined road map to success. When you follow a clear path that provides stepping stones leading you in the right direction, your chances of success are far greater. Seeing and understanding where you’re going will remove the fear and anxiety of merely starting. Knowing that others like you have found success by following these exact steps can bring comfort to beginning this journey for yourself. That is why we created the Level Up program. We have combined best practices in exercise, nutrition, and body composition knowledge to provide you with clear, easy to understand steps for real results. Level up is designed to give you multiple moments of pride along your journey. That’s why there are steps at each level for you to accomplish. These moments of pride will give you the motivation to push for the next level and continue seeing results. As you progress, each level adds a layer of difficulty for you to overcome while teaching you how to set and accomplish goals. Any true lifestyle change takes time, so don’t think that the Level Up program is a quick fix. Instead, take advantage of this program which was designed based off the tried and true success of our past and current clients. All you have to do is make the first step to start, and the rest is all “up” hill from there. Stop at the front desk to start today. Not a member yet? Call us at 330-499-2266 or visit HERE to get started! 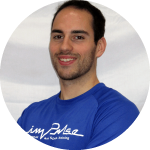 Evan has been a professional in the fitness, lifestyle and sport performance industry for over 6 years coaching numerous general fitness individuals and athletes in order to improve their physical health and performance. He's worked with individual clients to achieve fitness goals as well as leading large group training sessions. Evan spent the 2015-16 season working with the Ohio State Football strength and conditioning staff in Columbus. Evan graduated from Malone University in 2011 with a Bachelor's degree in Exercise Science. He is also a Certified Strength and Conditioning Specialist (CSCS) through the National Strength and Conditioning Association (NSCA).